Wow, how times flies, of course with vacation and health issues I have not been around as much. However, vacation is over and I’m feeling good. Since being back I have been busy leveling and helping my guild in Conquest Events. How have you been spending your time in SWTOR? Has leveling a new toon been more important that Conquests? Please let us know in the comments section below. Okay, it is time to get into this week’s HoloNet Links. The Shroud is back and has posted another encoded message. This message deals with events around the time of the Forged Alliance events. He refers to a Republic officer and a member of the Dark Council having secret meetings and this information comes from the planet Manaan. Speaking of Manaan, the message talks about the Order of Shasa and how they are following values associated with Darth Revan. There are many other examples in the post the Shroud mentions. All of these examples seem to confirm that the Revanites are up to something. 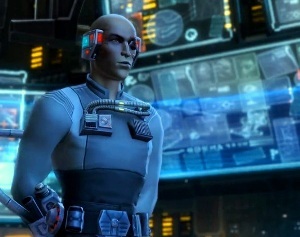 In fact, the Shroud issued this notice, “all embedded assets will make the Order of Revan their top priority.” Now if the galaxy’s top spy is pushing everything else back to make the Revanites his main focus, it is safe to say it is a big deal. All that and the fact the new expansion has Revan’s name in it; I can’t wait to learn more how all this will unfold. 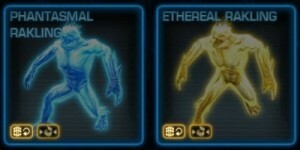 Be sure to read all through the post from the Shroud located on the SWTOR website. Update 2.10.2 went live this past Wednesday. Along with the normal fixes, patches, and changes there were several new additions placed on the Collections UI. They currently are not in-game, but with the names, colors and even a couple of masks closely resembling things possibly associated with Halloween, it is safe to say they will be added before next Friday. 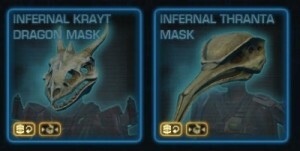 Keep an eye out for some of the items below hitting the Cartel Market or possibly an event. For more details and more images go over to Dulfy’s article that showcases all the newly added items. After doing a check to see what else was pulled into 2.10.2, we found that the ability for Guild Masters to allow other Ranks within the Guild to start Invasions was also put in! GMs can set this permission within the Ranks tab in the Guild window. I’ll put that in as part of my Patch Note update as well. Looks like a bit of guild interface and organizational changes were omitted in the patch notes. As the post by Tait Watson, it indicates guild leaders can now give permission to some members to select the planet the guild will invade for the weekly Conquest Event. This is a good change. It gives more freedom for guild leaders to appoint officers to be in charge of Conquest Events instead of the leader being in charge of that along with running their guild. Anything that gives guilds more latitude to run their things more efficiently is a good thing. It is a definitely a Quality of Life update. Thank you BioWare. Does anyone know if augmentation levels are going to increase (currently at 156) with the new expansion? Will they increase based on the maximum crafting level (without REing)? I can confirm that yes, there will be a new augmentation level in 3.0. I think it is safe to say that many of us believed that augment levels would increase since there will be an increase in the overall gear rating. Although after Eric’s post, our assumptions are confirmed. Start saving up your credits now, because when Update 3.0 goes live it will be time for buying and installing all new augments. Time for me to run some more dallies. This week’s SWTOR music video is from the Project Proteus. The video, by Revanites-Proteus production (great name), is set to song “I wish I had an Angel” by the group Nightwish. Not only did the Revanites help with the production, but Revan himself edited and directed the video. The song reminds me of a rock anthem – great lyrics set to some fast paced electric guitars and a heart pounding beat. 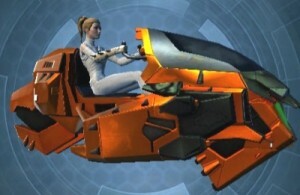 Along with the various cutscene footage ranging from class story, flashpoints and operation missions, there are subtitles that highlight the various in-game activities they enjoy. The video is really nice and the editing mixes well with the pace of the music. I enjoyed seeing the different guild screenshots that highlight their Shadowlands group and Harbinger members. I suggest giving this video a view and then head over to Project Proteus’ website to learn more about this gaming community.